There’s nothing that compares to getting out in nature. Whether you prefer to hike, boat, camp or just birdwatch, the great outdoors is where you spend most of your time. However, there’s something to be said for curling up in luxurious bedspreads with a good book and a soft blanket. Even the thought of a plush coverup on a cool day is comforting; even the most avid nature lovers need a day of rest now and then. Are you shopping for eco-friendly, fair trade blankets and throws you can feel good about snuggling up to? We’ve got a list of the top eco-friendly blankets to fit your home, your campsite and even your kids’ rooms. Here are the best earth-friendly blankets available that you’ll love covering up with. Over the past several decades, there’s been an increasing need to weighted blankets for bedspreads. Children and adults with sensory issues, those who suffer from anxiety or depression and people who experience insomnia will all benefit from the deep tissue massage offered by a weight blanket. If you’re looking for a weighted blanket that’s both eco-friendly and socially responsible, this Weighting Comforts review is just what you’ve been searching for. Available in two weights, the COOLMAX Weighted Blanket by Weighting Comforts is made from recyclable polyester and natural cotton. Choose your blanket weight using the chart on the Weighting Comforts website. Then, enjoy the experience the blanket provides either with your existing comforter or on its own. The blanket is measured to fit over one person so that the weight will be evenly distributed. It’s fully machine washable, so you can use it every night. Weighting Comforts blankets are sewn by Sew for Hope, a non-profit that provides fair trade jobs to refugees in Tennessee. In addition to supporting Sew for Hope, Weighted Comforts also offers a military discount to eligible customers. Next on our list of the top eco-friendly blankets is our Allswell Home review. This Grey Cotton Waffle Weave Coverlet is a great complement to your bedroom set, but we also love it for camping and just as a spare blanket for cool days on the couch. The Allswell Waffle Weave Coverlet is ideal as a top layer for your bed. Each blanket is hand crafted under fair trade conditions by artisans in Portugal and is comprised of 100% natural cotton. We love the stonewashed effect of the blanket; the lived-in look will make this your new favorite blanket right out of the box! Choose from three sizes of blanket to fit any bed. The natural fibers are machine washable, so the Waffle Weave Coverlet is an excellent choice for kids’ rooms. Have you ever grabbed a throw, only to find it’s just not quite long enough to cover your body? Either your feet are chilly or the throw is actually a lap blanket. If you know the struggle, this Grund America review is for you. This midweight blanket measures 70 inches long in the standard size. For our taller shoppers, Grund America actually offers a better option: a full 90 inches to ensure you’re completely cozy. Better yet, this blanket is GOTS Certified organic as well as OEKO-Tex Certified to be free from harmful chemicals. We love that this blanket is available in three colors: choose from ivory, slate grey or driftwood to complement any décor. Grund America is committed to green business practices; they’re Green Business Certified and they also partner with Goodweave International to end child labor worldwide. Grund America Coupon | Use code EARTH50 required for an extra $50 OFF your purchase of $200+ - good through April 30th. Luxor Linens is one of our favorite linen companies. In previous Luxor Linens reviews, we raved about the attention to detail and quality materials that Luxor commits too. Materials are responsibly sourced and products are ethically made. The quality of the finished result is so good that these products are featured in luxury hotels worldwide! It’s no surprise, then, that one of the top eco-friendly blankets is made by Luxor Linens. This light- to mid-weight blanket is made from 100% cotton and available in three colors. It’s machine washable and dryable, and the blanket makes a perfect gift, as you can even monogram the piece! While you’re shopping Luxor Linens, be sure to check out the company’s collection of organic blankets, sheets and more. Most can be customized and you can even add gift packaging to your purchase. DreamCloud is a New York based luxury mattress company that has redefined the luxury category in sleep. However, we love their mission just as much as we love their products. For our DreamCloud review, we’ve selected the BlanQuil Quilted Weighted Blanket. This throw is made in China from 100% cotton inner blanket with non-toxic eco pet-friendly weighted glass beads, and we think you’ll agree: you’ve never felt a softer comforting blanket. The generous size of the weighted blanket and comforting weight help apply deep pressure therapy and relaxing sensation. Customers who have bought the DreamCloud BlanQuil Quilted Weighted Blanket say it’s the perfect weight for spring nights. Many have even used it as an oversized blanket in the living room or family room while enjoying the next box office hit movie. We’ve already talked about how genuinely nice it is to snuggle up with a soft blanket. If you’re looking for the ultimate in coziness, this All the Feels review is perfect for you. The blanket is made from 100% recyclable polyester and is as soft as a cloud. A medium weight makes it perfect for any season. Wrap it around your shoulders at the campfire or just cover up on a cool spring night at home. All the Feels features a full line of eco-friendly, fair trade blankets. We love their mission, though. For every blanket purchased from All the Feels, the company will donate one blanket to a person in need. The group partners with non-profits like Covenant House, United Way and The Trevor Project to keep Americans warm. Bedding is an investment. Once you find a piece you love, you’ll want to keep it for a lifetime. What do you do, then, when you just want to change the look of your existing bedding? You check out this SOL Organics review! SOL Organics is a fair trade, eco friendly company that makes bed, bath and baby essentials from sustainable and organic materials. The group is happy to provide fair trade, organic products at an accessible price, and customers love the quality and feel of the cottons. This duvet set is GOTS Certified organic and is absolutely gorgeous. Clean lines and a banded detail lend a classic look to any bedroom. Your set includes a duvet cover and two shams. Shop around the SOL Organics website to find a pair of sheets to add to your purchase! Pacific Coast Feather is another earth-conscious bedding brand you’ll find in hotels around the world. Travelers who have fallen in love with the soft downs the company creates will be thrilled to know that Pacific Coast Feather offers individual customers the opportunity to shop for those same linens on the business website. For our Pacific Coast Feather review, we’ve selected the Clover Down Blanket, which is available in three sizes. You can also select from four muted or neutral colors to match the design of your home. The comforter is just what you’d expect from a light warmth, luxury style comforter, down to the satin border detail. All Pacific Coast Feather products are filled in the USA with feathers washed using a chemical-free process. As a result, the blankets and comforters are hypoallergenic and a great fit for your child’s bedroom. Pacific Coast Feather Coupon Code | No code required for 20% Off on comforters and feather beds and pillows - good through May 13th. Next on our list of the top eco-friendly blankets is our Viva Terra review. This company is one we’ve featured before; the catalog includes home goods and gifts that are sustainably sourced, vegan, organic and fair trade. Among those products is this hypoallergenic down-filled box-stitch blanket. If you’ve got a favorite organic duvet cover but are looking for a basic blanket to fill it, this box-stitch blanket is a super choice. It’s filled to just the right amount of “fluff” with farm sourced, cruelty-free feathers. The blanket is hypoallergenic and the perfect “base” for any eco-friendly bedding set. While you’re shopping Viva Terra, be sure to take a look at the home décor, gifts and apparel available through the website. Every product on the site is crafted under fair working conditions, and the group partners with TerraPass to create, package and ship products leaving the smallest footprint possible. Are you shopping for blankets for your guest bedroom or just to have a few spare blankets? Maybe you’re looking for eco-friendly, affordable bedding options for yourself, or for your child’s room. Whichever applies to you, we know you’re going to love this QBedding review. Cozy, comfy and oh-so-soft is how we’d describe the Coffee Faux Fur Sherpa Blanket. Available in twin size, this blanket is thick and plush enough to keep you or your guests warm on even the coldest nights. Better yet, it’s reversible. Lay it white side up and enjoy a splash of color when you offer your guests turn-down service. The QBedding Coffee Faux Fur Blanket is made from 100% recyclable polyester fabric. The dyed side resembles a soft, fluffy fur while the white reverse is tightly woven like lamb’s wool. Use the Faux Fur Sherpa on your twin or futon bed, or just keep a few on hand for family movie nights. There’s little else that will warm your bones on a cold night than a heated blanket. That’s why we’ve chosen a Cuddledown review for our list of the top eco-friendly blankets! Cuddledown is an American company, based in Maine. In other words, they know how to keep warm! From sheets to slippers, the company handcrafts each product in the catalog in their New England factory. 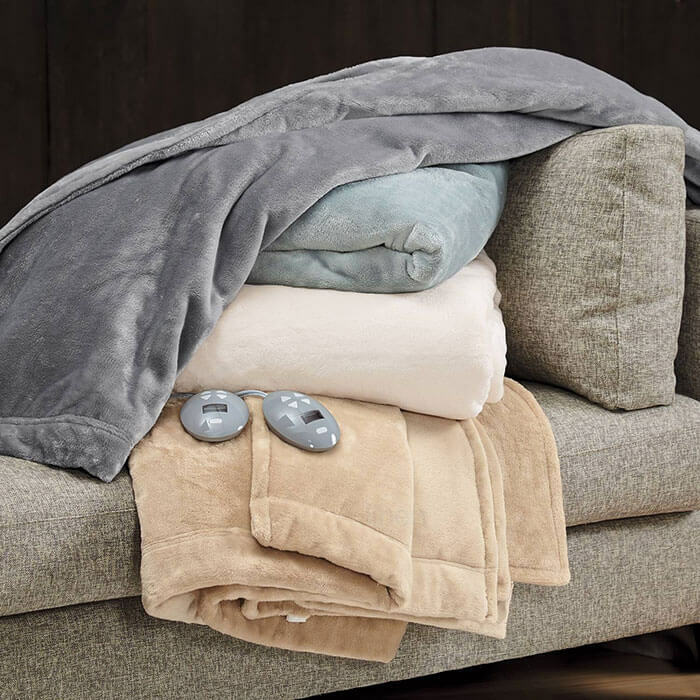 The Cuddledown Plush Heated Blanket will keep you warm – no doubt about it. However, there’s more to love about the cover than that. First, the product is eco-friendly and non-toxic. It’s made from 100% recyclable polyester, and the materials in the blanket are OEKO-Tex certified. Interestingly enough, although it’s an electric blanket, it’s machine washable! Choose from twin, full, queen and king sizes. Do you sleep hot while your partner gets chilly? Don’t worry! The queen and king sizes have dual, customizable digital heat controls. Stray & Wander is a smaller company than some others we’ve featured on Citrus Sleep. However, we love their mission just as much as we love their products. Stray & Wander employs family-owned businesses, woman artisans and individuals around the world to provide fair trade, ethically sourced linens. For our Stray & Wander review, we’ve selected the Brook Blanket. This throw is made in Turkey from hand-loomed organic Turkish cotton, and we think you’ll agree: you’ve never felt a softer blanket. The throw is individually handcrafted by Turkish artisans so no two blankets are exactly alike. Customers who have bought the Stray & Wander Brook Blanket say it’s the perfect weight for spring nights. Many have even used it as an oversized blanket at the beach, music festivals and family picnics. PureDown is mostly known for offering responsibly sourced down, harvested in a cruelty-free way. The Responsible Down Standard, adhered to by PureDown, ensures that feathers from geese and ducks are harvested in a manner that causes no unnecessary harm to the birds. With that said, the blanket we’ve chosen for our PureDown review doesn’t contain any feathers at all. Instead, we’ve selected a weighted blanket which is crafted from sustainable cotton and recyclable polyester and glass beads. Choose from a variety of weights when you select your blanket; PureDown offers a range from 7 to 25 pounds. You’ll love the soft cotton outer layer and the comforting weight of the glass beads inside. Don’t worry about noise, either. The beads are sewn into individual compartments, keeping them from shifting while you sleep. Some people love the feel of a down blanket but would prefer that the comforter contain no animal products at all. If that sounds like you, we’ve created this Downluxe review with you in mind! The Downluxe Lightweight Down Alternative Blanket features a peachskin polyester shell that’s completely recyclable. Customers who have used the product say it boasts some great features, too. First, it’s machine washable. After washing, just put it in the dryer to fluff back up. They also love the baffle box stitching, which keeps filling firmly in place – no more lumpy comforters. Choose from five understated, calming colors and two sizes when you buy your Down Alternative Blanket. Each product sports a satin binding to add just a touch of elegant detail. We just love Riley Home. The company is a family-owned business. For four generations, Riley Home has been partnering with Portuguese artisans to produce fair trade, natural and sustainable linens. Riley Home sells direct, which means everyone can have access to handcrafted, eco-friendly bedding. This Cotton Coverlet by Riley Home is, of course, handcrafted by artisans in Portugal. It’s available in two sizes and four shades, but the coverlet is a perfect match to each and every bedding set available in the Riley Home catalog. As you’d expect from a green company, the coverlet is made from 100% cotton, guaranteeing breathability and ease of care. We can’t include a Riley Home review without mentioning the company’s give back initiative. BLANKET THE CITY is a project launched by Riley Home. Working with non-profits across the United States, Riley donates a new blanket to a homeless shelter for every purchase over $300. The last on our list of the top eco friendly blankets is our HILLFAIR review. HILLFAIR is an Indian company that specializes in fair trade, ethically sourced linens. All HILLFAIR products are ethically spun, milled, sewn and packaged. The company catalog includes blankets, towels and other household essentials. Our favorite in the product line is this 100% organic cotton blanket. It’s truly an all-season blanket, great for chilly summer mornings or even cold winter nights. Soft, GOTS Certified organic cotton is machine washable and easy to care for, and the blanket is available in three sizes: twin, queen and king. Not only is the HILLFAIR organic blanket sustainable, it’s also made using low-impact dyes. Cotton, of course, is grown without the use of fertilizers and chemicals, and the dyes used in production are free from heavy metals, making them much easier on the world’s waters. Lisa Czachowski is a professional social blogger and has worked on several online publications including Citrus Sleep. Lisa is an experienced content writer and copyeditor. You will find many of her works throughout CitrusSleep.com that cover a wide array of subjects including sustainability, natural, sleep products, health, fashion and many more. She is passionate about what providing as much information as possible on products you bring in your home and what we wear.